We have listed below, the oldest surviving RCMP Veterans with the lowest regimental numbers and added a listing of the oldest surviving Veterans. Reg.#14696 – Retired Staff Sergeant John R. Hovey joined the Force on April 10, 1946 and served his entire career in “K” Division. John retired on January 6, 1969. He had previously served in the Canadian Army during World War II (June 4, 1940 to 1946). Reg.#14011 – Retired Sergeant Harold Searle joined the Force on February 3, 1942 and retired in 1962. Harold is currently 98 years old. 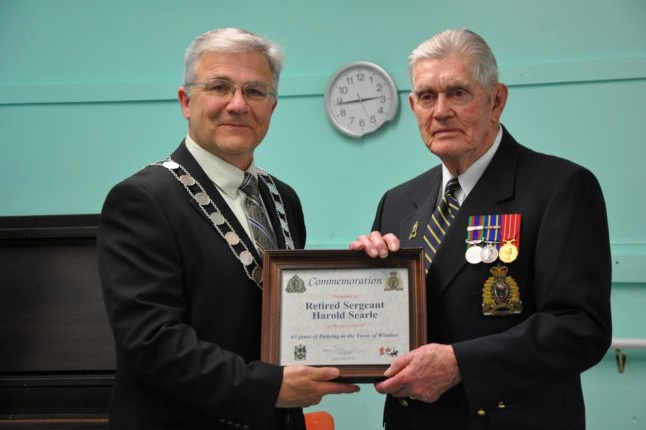 Photograph of the Mayor Paul Beazley of Windsor Ontario making a presentation to retired etired RCMP Sergeant Harold Serle (Reg.#14011) (Source of photo – Harold Serle). Reg.#13965 – Retired Staff Sergeant Nelson Craig joined the Force on January 2, 1941 and his entire career was spent in “O” Division. He retired on October 31, 1965. He currently lives in Whitby Ontario and turned turned 96 on Apr 11, 2016. Nelson is a Life Member of Toronto Division. Photograph of Nelson Craig – Reg.#13965 (Source of photo Jack O’Reily). Reg.#13967 – Retired Staff Sergeant George William Fridgen joined the Force on January 2, 1941 and served “A”, “Depot” and “HQ” as the Quarter Master Sergeant. 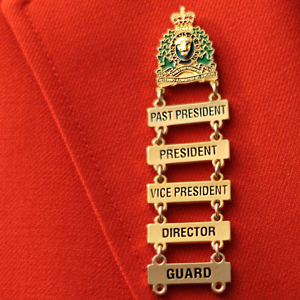 After retiring on December 30, 1974, he joined the RCMP Veterans’ Association and would later become a Life Member of the Ottawa Division. Reg.#13965 – Retired Staff Sergeant John Nelson Craig joined the Force on January 2, 1941 and served his entire career in “O” Division until his retirement on October 31, 1965. SECOND OLDEST SURVIVING RCMP VETERAN WITH LOWEST REGIMENTAL NUMBER – Reg.#13134 – Retired Staff Sergeant Mike Pepe joined the Force on December 28, 1938 and served in “K” (Edmonton) and “B” Divisions (Newfoundland). He retired on January 4, 1966. 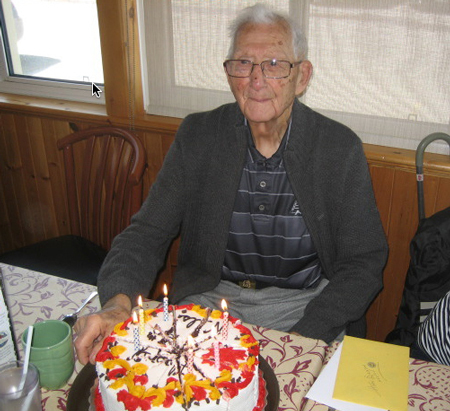 Mike currently lives in Port Elgin Ontario and turned 100 on Dec 2, 2017. He is a member of the Edmonton Division and attended AGM 2014 in Ottawa. OLDEST SURVIVING RCMP VETERAN WITH LOWEST REGIMENTAL NUMBER – Reg#13013 Eugene Dean HADLEY joined the Force in April 1938 and was the radio operator in the St. Roch’s original Northwest Passage from Vancouver to Halifax. He retired from the Force with 42 years of service and is now living in California. Photograph of former RCMP member Eugene Dean Hadley (Reg.#13013). If you have details on any other Veterans who we can add to this list, please email us at strong16941Sheldon@gmail.com.